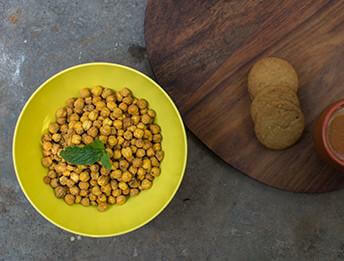 Protein-rich roasted Chana in mint flavor for guilt-free anytime snacking. A perfect healthy option for evening snacks or for late night munching. Most of us struggle to decide what to eat in the evening & end up eating samosas or chips. And all our efforts to lose weight go down the drain. Our healthy snack Roasted Chana (Mint) is made using very high quality ingredients which is high in protein. 1. Bengal gram is an excellent source of manganese, magnesium and phosphorus. Manganese plays a vital role in energy production. 2. Bengal gram has low glycemic index (GI), which causes slow and steady release of glucose into the bloodstream and thus maintains blood glucose levels. 3. This legume helps in maintaining proper electrolyte balance in the body due to the presence of potassium and magnesium and lowers hypertension.